The combination of two omnidirectional microphones in the intelligent two-microphone system actively monitors and analyses the phase difference from various sound source while recording. By actively analysing the phase difference, the Intelligent two-microphone system creates high directionality mode for dictation suitable for recording in a noisy environment and stereo recording mode for Conference Recording. The DS-9500 incorporates low noise omnidirectional microphones which are also used in our consumer flagship LS-P1 PCM recorders. The shock absorber which covers the microphone unit reduces touch noise from your hand to the body. Once the device is connected to a network via Wi-Fi, you can send your dictation anytime anywhere. Thanks to the Wi-Fi connectivity, authors no longer need to carry a PC to download the dictations to the ODMS workflow. Since you can send the dictations via Wi-Fi at any time, the device does need to be physically connected to the docking station. If you have a smartphone connected to a mobile data network, connect the device by Wi-Fi tethering. Your dictations can also be sent via the mobile data network. This is convenient when you are on the go. In addition to securing the data, the DS-9500 Device Lock feature protects the device from unauthorised access using a 4-digit PIN code, making sure all data stays off limits to unauthorised individuals. The data loss prevention function allows changing the DS-9500 into a read-only device when it is connected to a PC. It prevents the careless copy of sensitive data to the PC and network. This function can be enabled in workgroup mode. Since the slide switch is the most used part of the device, it is essential to offer a durable and reliable switch in order to support our customers in a professional environment. The construction had been changed from a mechanical switch to an optical switch which simplifies the structure of the component. Thanks to this change, it reduces the potential risk of defect, yet offering the same usability at the same time. The DS-9500 features a 2.4 inch TFT colour LCD. This is 40% larger than the previous model, and supports 240,000 colours, making the information on-screen much easier to read. The file List view function had been added to the DS-9500 which shows the file name, date & time, file status and the priority settings of each dictation file. Files can be selected from the list for Wi-Fi transfer or file delete. Also, you can sort the dictation file by status, work type or option ID. The sensor detects the movement of the body and automatically wakes the device from sleep mode. 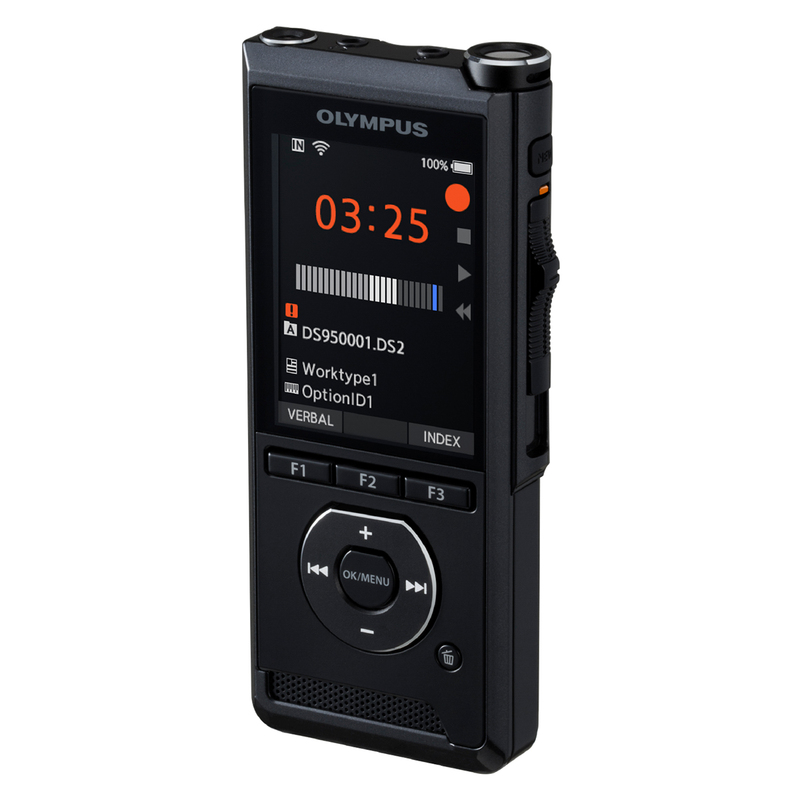 This feature is essential for heavy users who want to immediately start recordings. In order to get the best performance out of the speaker unit, the housing had been designed to have enough space behind the speaker unit to form an enclosure. The position of the speaker unit had been optimised for a square type speaker so that the sound wave generated from the front and the back does not cancel each other. Thanks to this construction, the speaker generates enough volume with good sound quality even from the smaller opening of the body. This also helps to keep the speaker unit away from dust. The LI-92B Lithium-ion battery used in our DI compact cameras had been chosen for the battery for the DS-9500. Users can exchange the battery during long use. DS-9500 Dictation machine, ODMS R7 DM Single License, LI-92B Lithium-Ion Battery, A517 AC Adapter, CR21 Docking Station, KP30 micro USB cable, CS151 Carrying Case.